We're not sure there's a way to mark 200 days in office as the President of the United States, but Donald Trump certainly did it in a memorable way. 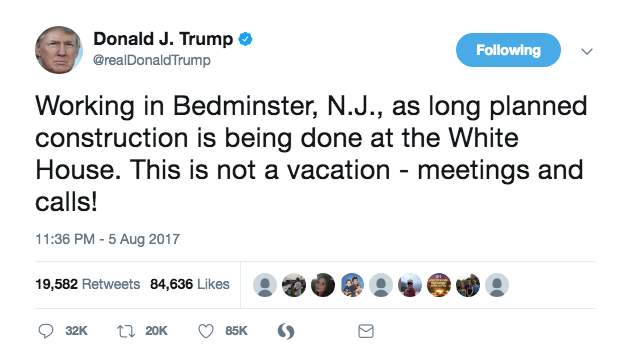 The US leader is currently in Bedminister, New Jersey. Following pictures of him golfing emerging in US press reports, the President took to Twitter to defend himself in very Trump-like fashion. Following this tweet, he proceeded to launch a series of tweets lambasting major news outlets, making claims of 'fake news' against them. He claimed this, along with other factors like economic deregulation, etc, were driving the Trump base closer together. Trump also attacked a senator - Richard Blumenthal, a Democrat representing Connecticut - claiming he had defrauded the American people and calling him a con artist.